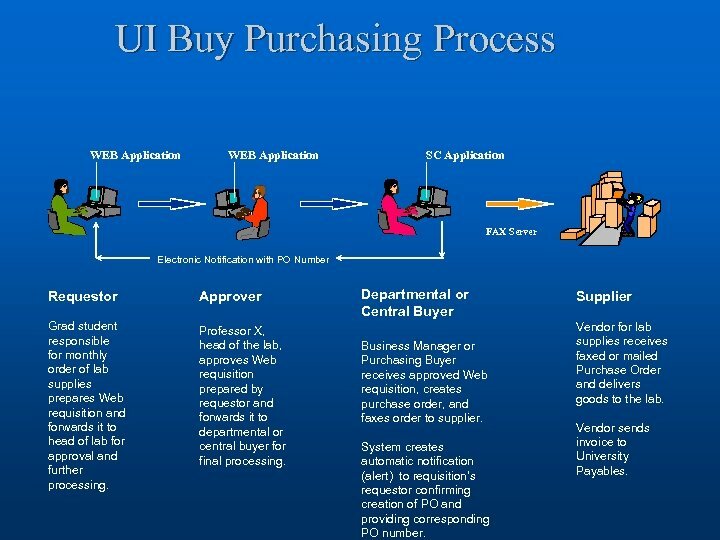 UI Buy Purchasing Process WEB Application SC Application FAX Server Electronic Notification with PO Number Requestor Approver Grad student responsible for monthly order of lab supplies prepares Web requisition and forwards it to head of lab for approval and further processing. Professor X, head of the lab, approves Web requisition prepared by requestor and forwards it to departmental or central buyer for final processing. Departmental or Central Buyer Business Manager or Purchasing Buyer receives approved Web requisition, creates purchase order, and faxes order to supplier. System creates automatic notification (alert) to requisition’s requestor confirming creation of PO and providing corresponding PO number. Supplier Vendor for lab supplies receives faxed or mailed Purchase Order and delivers goods to the lab. Vendor sends invoice to University Payables. 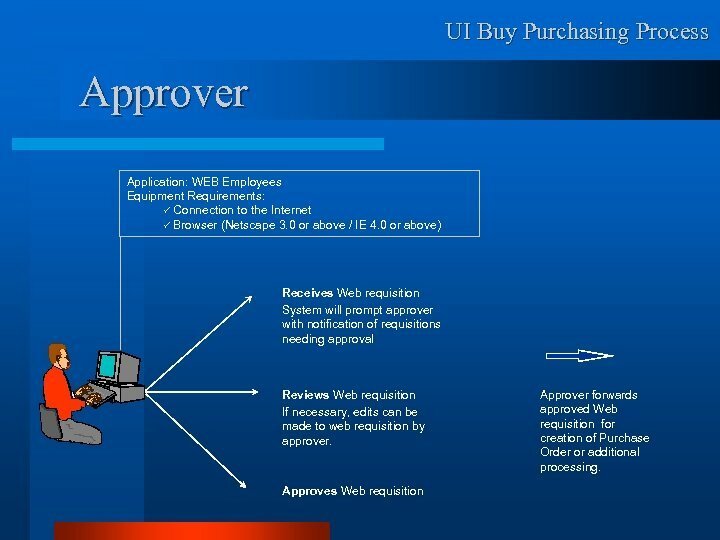 UI Buy Purchasing Process Approver Application: WEB Employees Equipment Requirements: ü Connection to the Internet ü Browser (Netscape 3. 0 or above / IE 4. 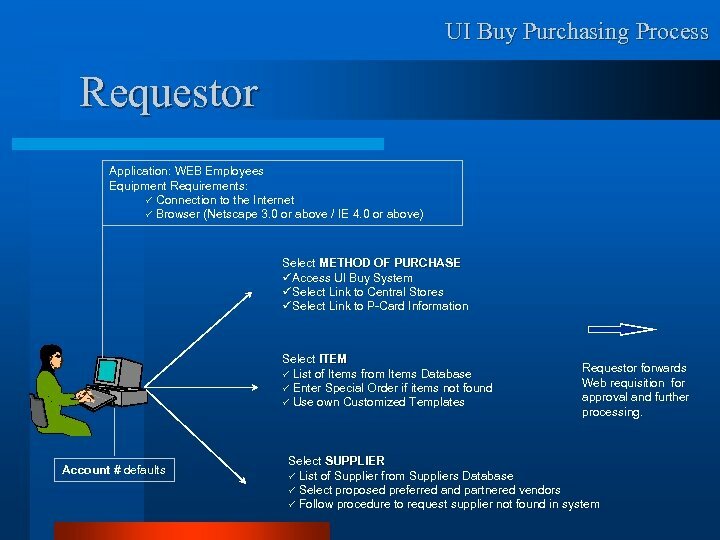 0 or above) Receives Web requisition System will prompt approver with notification of requisitions needing approval Reviews Web requisition If necessary, edits can be made to web requisition by approver. Approves Web requisition Approver forwards approved Web requisition for creation of Purchase Order or additional processing. 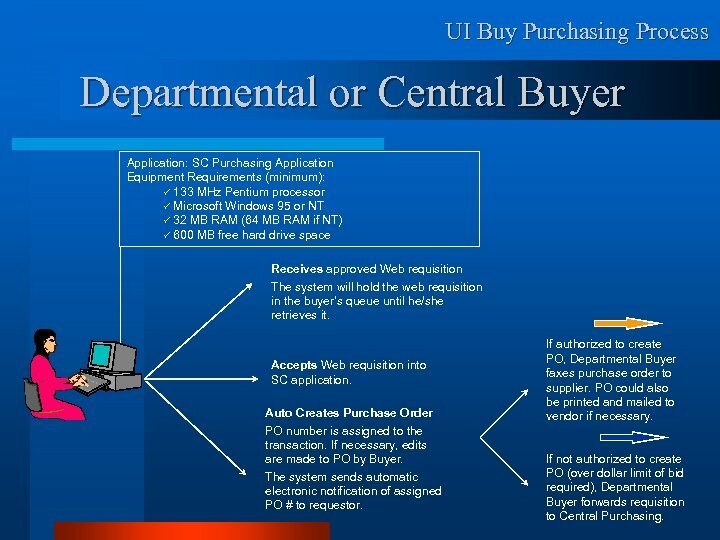 UI Buy Purchasing Process Departmental or Central Buyer Application: SC Purchasing Application Equipment Requirements (minimum): ü 133 MHz Pentium processor ü Microsoft Windows 95 or NT ü 32 MB RAM (64 MB RAM if NT) ü 600 MB free hard drive space Receives approved Web requisition The system will hold the web requisition in the buyer’s queue until he/she retrieves it. Accepts Web requisition into SC application. Auto Creates Purchase Order PO number is assigned to the transaction. If necessary, edits are made to PO by Buyer. The system sends automatic electronic notification of assigned PO # to requestor. 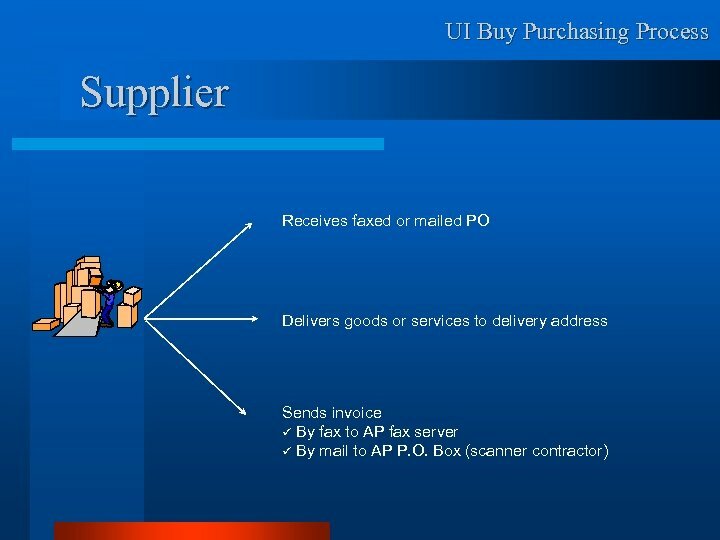 If authorized to create PO, Departmental Buyer faxes purchase order to supplier. PO could also be printed and mailed to vendor if necessary. If not authorized to create PO (over dollar limit of bid required), Departmental Buyer forwards requisition to Central Purchasing. 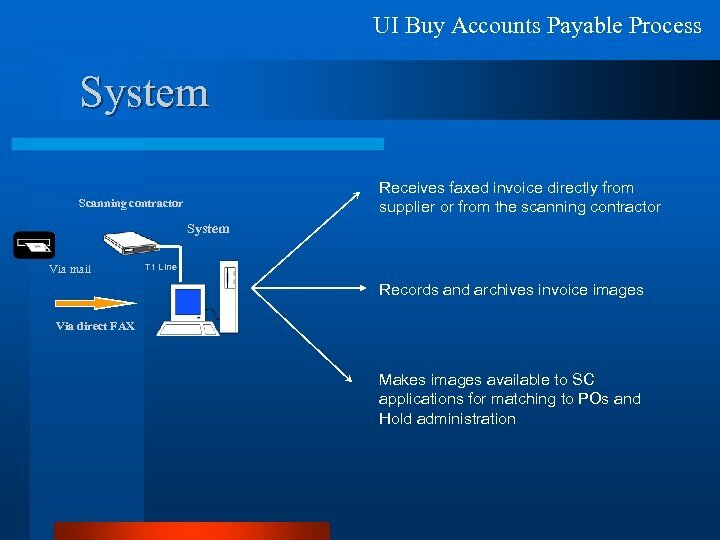 UI Buy Accounts Payable Process Scanning contractor System SC Application Via mail SC Application T 1 Line Via direct FAX Invoice on hold Supplier System Accounts Payable Technician Accounts Payable Special Actions Vendor faxes invoice to system fax server or mails invoice to University Payables P. O. Box. The System receives the invoice and administers the image. 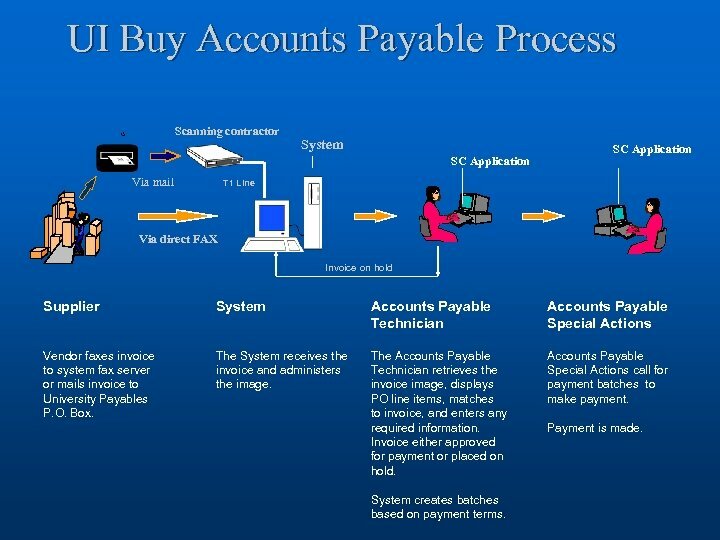 The Accounts Payable Technician retrieves the invoice image, displays PO line items, matches to invoice, and enters any required information. Invoice either approved for payment or placed on hold. 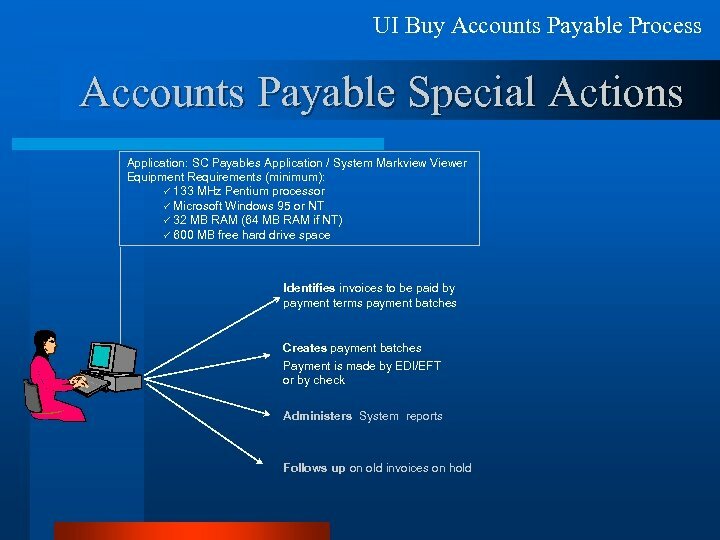 Accounts Payable Special Actions call for payment batches to make payment. System creates batches based on payment terms. Payment is made. 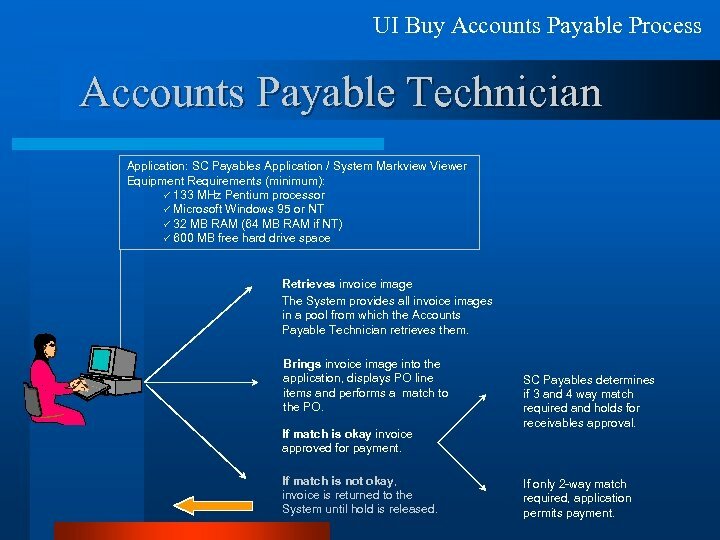 UI Buy Accounts Payable Process Accounts Payable Technician Application: SC Payables Application / System Markview Viewer Equipment Requirements (minimum): ü 133 MHz Pentium processor ü Microsoft Windows 95 or NT ü 32 MB RAM (64 MB RAM if NT) ü 600 MB free hard drive space Retrieves invoice image The System provides all invoice images in a pool from which the Accounts Payable Technician retrieves them. Brings invoice image into the application, displays PO line items and performs a match to the PO. If match is okay invoice approved for payment. If match is not okay, invoice is returned to the System until hold is released. SC Payables determines if 3 and 4 way match required and holds for receivables approval. If only 2 -way match required, application permits payment.